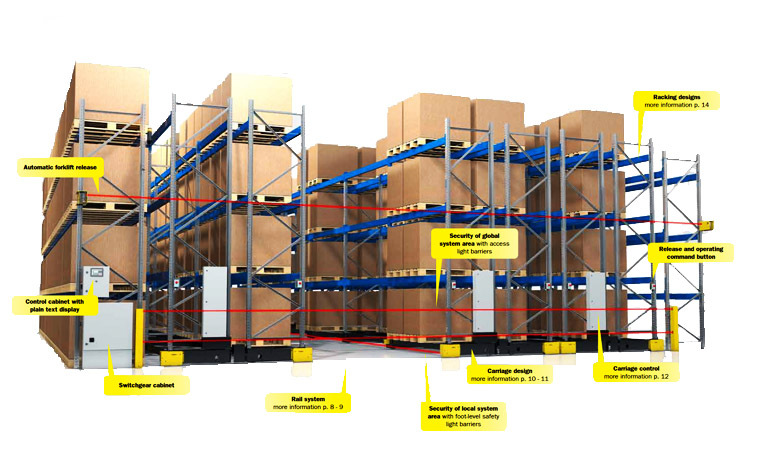 What is Mobile Pallet Rack? Mobile Racking is a conventional, selective pallet rack mounted on carriages which moves on rails embedded into the concrete floor. Aisles can be accessed via manual or remote RFID control. Any number of racks are mounted on carriages and moved on rails using electric motors. Commands are communicated to the mobile racking by radio remote control. The operational release button and carriage controls are fixed directly to the carriage. This prevents unnecessary external components, thus raising the safety level of the system. Mobile Pallet racking systems are selective racking mounted on heavy duty bases, which are electrically driven on tracks mounted into floor slab. Every SSI SCHAEFER mobile racking system is equipped with modern safety controls which meet all International safety standards. A modular design concept allows the system to be designed specifically according to your preferences and requirements. 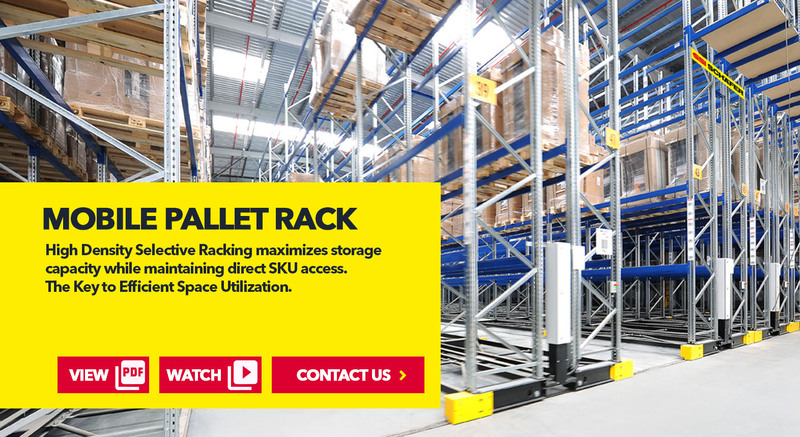 By converting racking aisles into useable space for logistics and other purposes, mobile racking systems can create up to 100% increase in available pallet locations, offering a cost effective storage solution. Reduced operating and property costs thanks to excellent space utilisation of the system. The combination of SSI SCHAEFER mobile racking systems with our expertise in conveying, the powerful electric drive units and designs make our system the first choice for cold store operators. 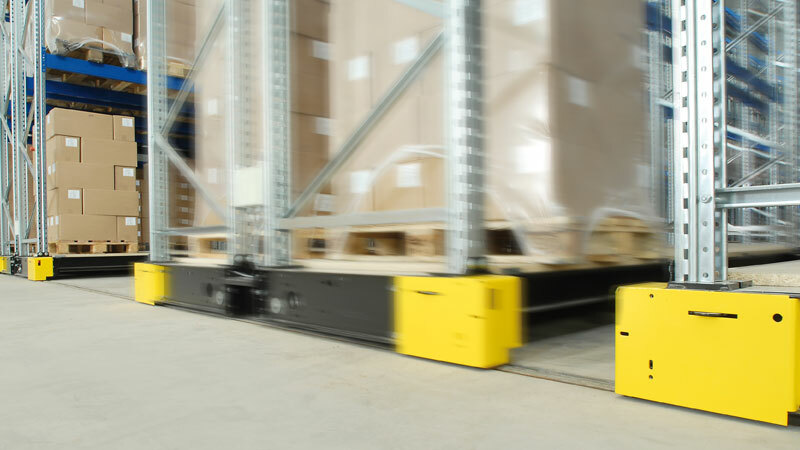 Equipped with emergency stop buttons, access light barriers, manual release system, distance sensors and safety light barriers, our mobile racking solution meets the highest possible demands for safety and makes a significant contribution to running your warehouse problem-free and accident-free. High cost environment e.g. Cold stores of where space is at premium. 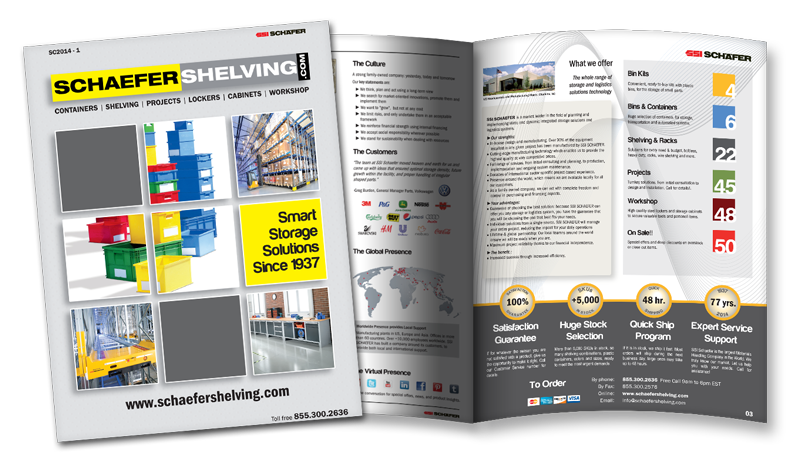 Mobile Pallet Racking from SSI SCHAEFER can reach up to 110,000 lbs. of loading capacity per bay and due to robust, welded center beams, hot-rolled IPE beams, and an innovative base construction that includes a four-wheel travelling mechanism with wear-reducing ball bearings to reduce loads affecting the floor. 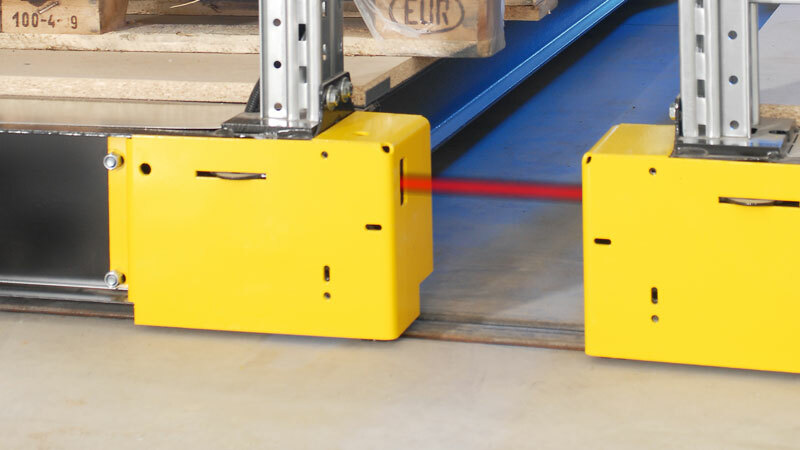 Equipped with emergency stop buttons, access light barriers, manual release system, distance sensors and safety light barriers, SSI SCHAEFER mobile racking solution meets the highest possible demands for safety and makes a significant contribution to running your warehouse problem-free and accident-free. Four-wheel travelling mechanism. Advantage for supporting structure planning. Loads affecting the floor are reduced due to the four wheels. Bearing design. Total wear reduction. Four raceways of the groove ball bearings avoid one-sided loading. Center beam. Robust, welded center beam. Complete torsional stiffness and dimensional stability. Electric drive. High performance drive concept. Two gear stages in direct gearing with matched motor control. High quality construction. Exceeds all RMI Standards. Galvanized frame finish. Painted beam finish. Remote control with graphic display. The aisle to be opened is selected on demand by pressing the button on the mobile racking or on the remote control carried by the forklifts. 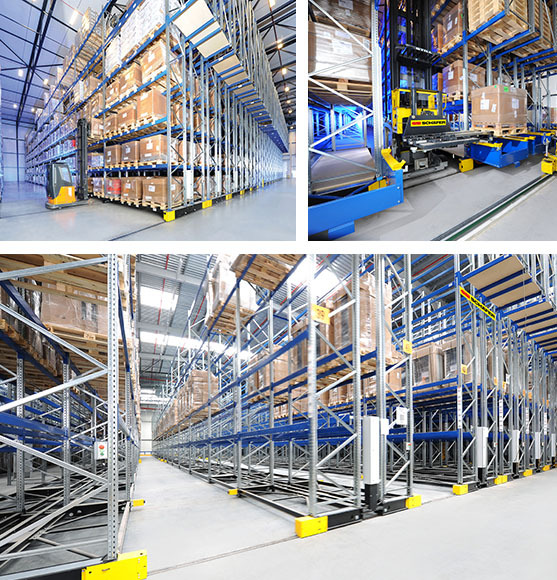 Time saving thanks to coordinated movements of the mobile racking and the forklifts. Integrated automatic forklift release. Dynamic change of the aisle during rack movement possible. Watch SSI SCHAEFER Mobile Pallet Rack in action! 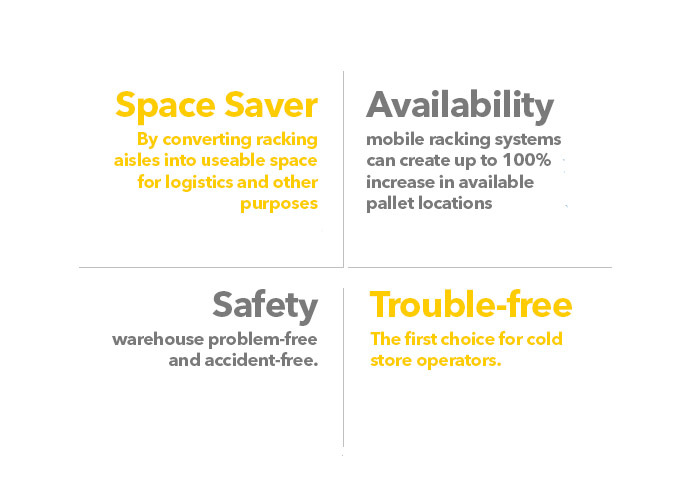 Mobile Racking will minimize the overall footprint of your warehouse, a key aspect in cold storage or deep freezer applications. 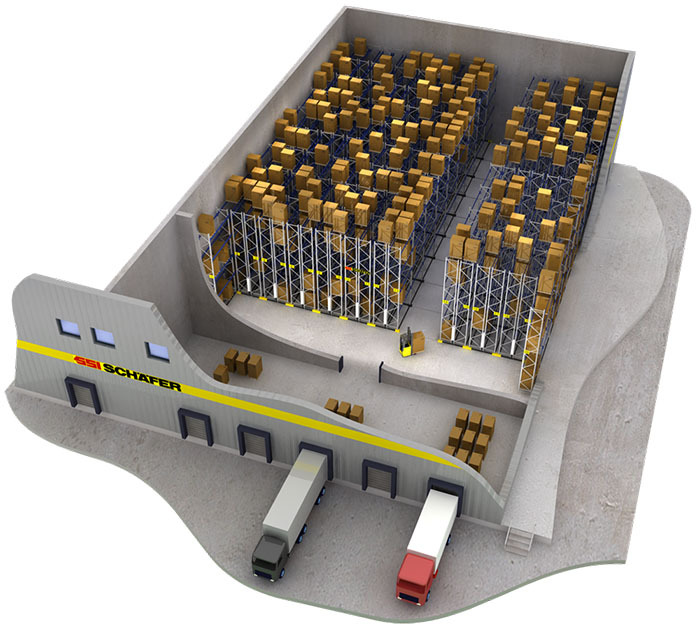 It can also free-up valuable warehouse space for other activities, so you can expand without having to relocate, improving your efficiency while reducing overall costs. Our expertise provides these customers with made-to-measure, innovative project implementations. Our comprehensive network of branches and our worldwide presence ensures that we are always on hand, around the globe.